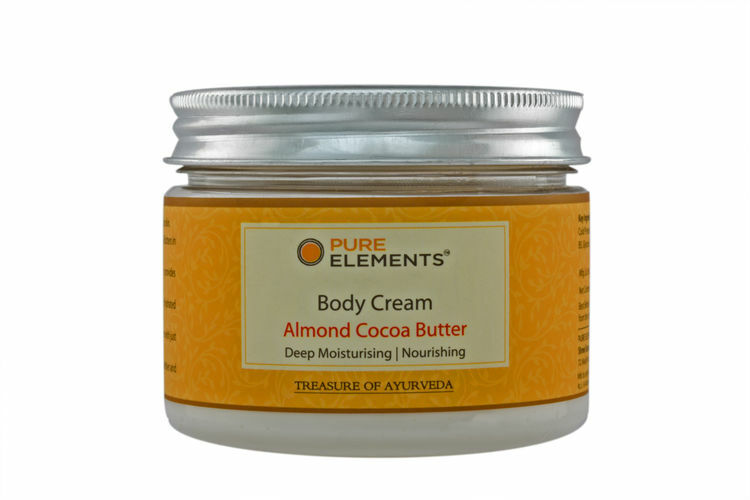 Infused with extracts of precious Ayurvedic Herbs and Vit E Oil, Pure Elements Almond Cocoa Butter Body Cream provides essential nutrients and works as a complete skin revitaliser. An ultra-rich body cream which offers deep moisturising to your skin. This highly nourishing and pH balanced cream keeps skin soft and hydrated whole day. Noticeable change in the elasticity and texture of the skin can be seen with just few applications. Key Ingredients: Cold Pressed Almond Oil, Kokum Butter, Cocoa Butter, Shea Butter, Sesame Oil, Vit E Oil, Vit B5, Glycerin, Rosewater and Botanical Extracts of Ashwagandha, Shatavari and Anantamul.